Three years ago, I discovered The Great Food Blogger Cookie Swap, probably while procrastinating school work and perusing food blogs. I had just started my little blog at the time, so I eagerly signed up for an email that would let me know when I could sign up for the following year. Two years ago I was living in Spain (wah, where does time go!). Suffering from a serious case of FOMO, I signed up for the cookie swap even though I was out of the country, and my wonderful mother baked and mailed my cookies for me. She even froze the cookies I received in the mail until I came home for the holidays. I know, I’m so spoiled. Last year, I created a biscotti blizzard in the kitchen and might have prioritized cookie swapping over studying for finals. Just a little bit. This year, I swore I’d be more organized. I wasn’t. But! 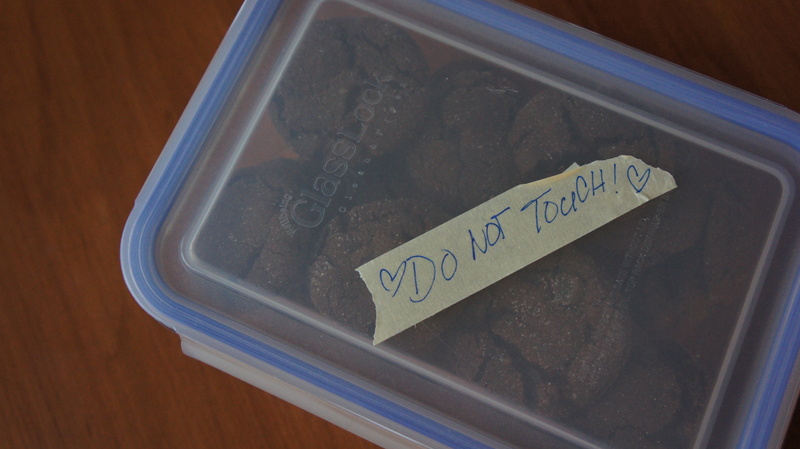 Somehow, cookies were made and mailed. I’ve almost survived another exam season. And the novelty of receiving pretty packages full of cookies in the mail continues! To my fellow Canucks, Allison, Jenny, and Rhonda — thank you for the loveliest swaps. And once again, thank you to Julie and Lindsay for organizing the whole thing for a good cause. This is starting to become a lovely holiday tradition. 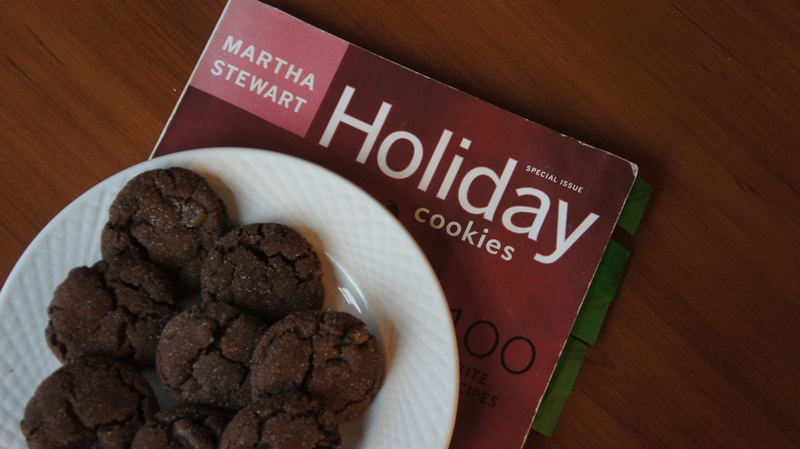 The cookies I mailed this year are adapted from a Martha Stewart recipe and have been part of my mum’s cookie rotation for over a decade. They’ve stood the test of time; I loved stealing them warm out of the oven as a kid and I love making them now (it doesn’t count as ‘stealing’ if I’m the baker, right?). 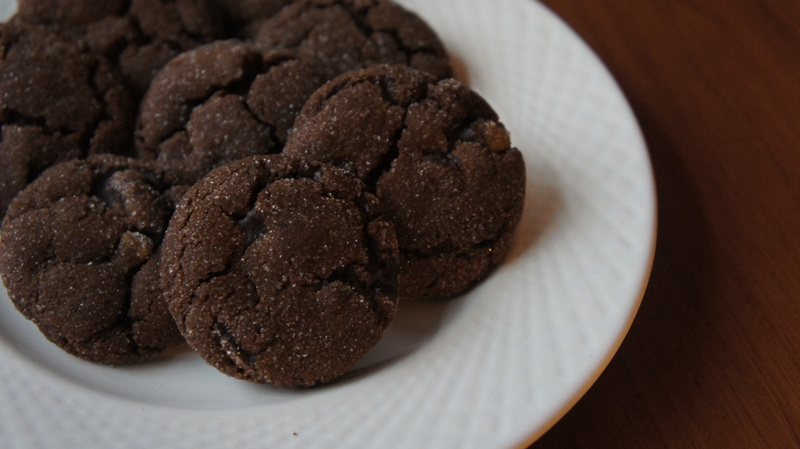 With three different kinds of ginger — fresh, powdered, and crystallized — there’s a nice warm kick to these fudgy treats. 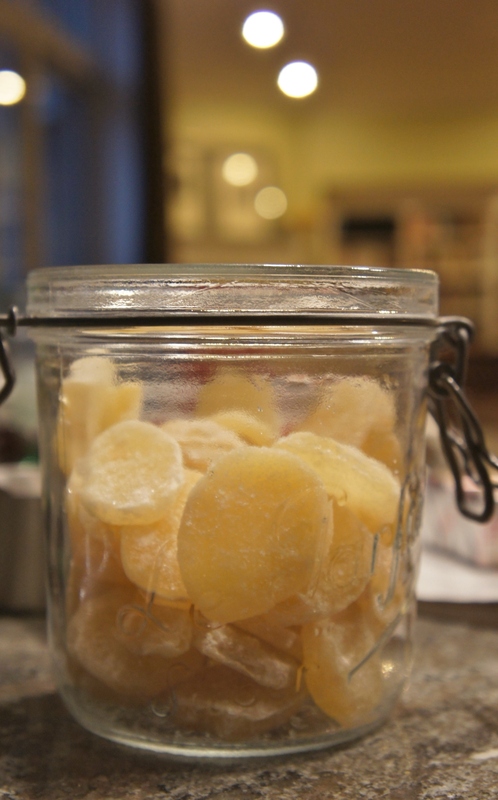 1.Chop both the crystallized ginger and the chocolate into ¼ inch chunks (or you can use good quality chocolate chips, about ¾ cup), set them aside. Sift together the flour, ground ginger, cinnamon, cloves, nutmeg, and cocoa powder in a medium bowl. 2.In the bowl of an electric mixer, using the paddle attachment, beat the butter and freshly grated ginger on medium speed until it’s lightened and fluffy (approx.. 4 minutes). Add brown sugar; beat until combined. Add the molasses; beat until combined. 3.In a small bowl, whisk the baking soda into the boiling water until dissolved. Beat one half of the flour mixture in the butter mixture. Add the baking-soda and water, then the rest of the flour mixture. Add the chopped chocolate and crystallized ginger. 4.Turn the dough out onto a piece of plastic wrap and pat it down until it is in a disk that is about 1-inch thick, seal with wrap. Refrigerate for at least 2 hours. 5.Line two cookie sheets with parchment paper and preheat your oven to 325°F. Roll the dough into 1 ½ inch balls and place them 2 inches apart on the baking sheets. Refrigerate for about 20 minutes (or freeze for 10). Roll the balls of dough in granulated sugar. Bake for approximately 10-12 minutes, until the surface of the cookies start to crack slightly. Remove from the oven and let them cool for 5 minutes before placing them on a wire rack to cool completely. 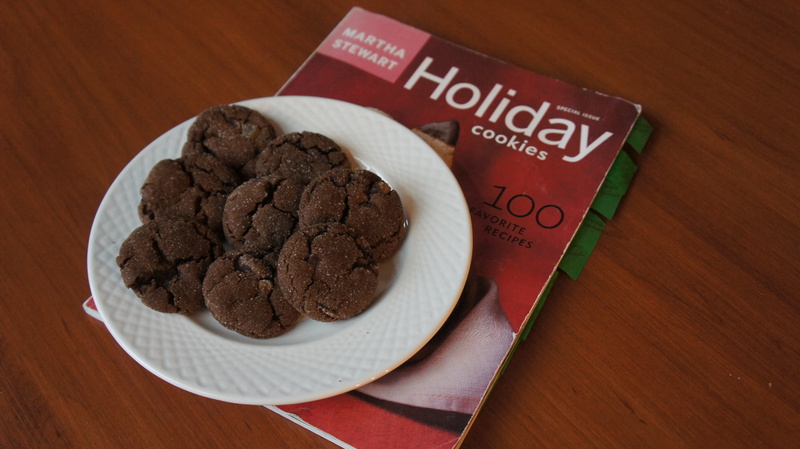 These cookies freeze really well, so should you have leftovers or want to save some for later in the holidays, you can be extra organized! (Not something I usually excel at.) Happy cookie swapping! This entry was posted in Desserts & Indulgences and tagged baking, cookie swap, holiday desserts, snail mail, the great food blogger cookie swap, tis the season by kshap. Bookmark the permalink.